The 2015 National Action Network Triumph Awards Television Broadcast Airs Oct 3rd! 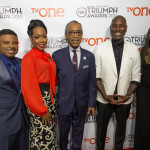 TV One today announced the inaugural television broadcast of The 2015 Triumph Awards presented by Reverend Al Sharpton and National Action Network (NAN) will air on Saturday, October 3 at 8PM/ET. Filmed in Atlanta, GA and hosted by Tichina Arnold, this esteemed ceremony recognizes the triumphant impact this year’s honorees have made on our society. Recording artist and philanthropist Tyrese Gibson was presented the Entertainer of the Year honor by Martin Luther King III and received a special message from friend and fellow entertainer Ludacris. With a body of work as a civil rights leader, activist and minister spanning over eight decades, Rev. Dr. Joseph Echols Lowery received the Chairman’s Award for Historic & Transformative Service from NAN’s Dr. W. Franklyn Richardson and Rev. Al Sharpton. Emmy® winning comedienne, actress and producer Wanda Sykes received the Activism in the Arts honor for her years of service to youth homelessness and engagement within the LGBT community. Chief Diversity Officer and Global Director of Education and External Relations for Intel, Rosalind Hudnell was presented the honor of Corporate Executive of the Year in support of her distinguished leadership within the corporate sector. The night’s final honor, the President’s Award for Service and Humanitarian Efforts, was presented to John Legend for his work as a vocal champion for social justice who gave the audience a special treat during his acceptance speech by singing “Wake Up Everybody” before turning it over to Tichina Arnold to close the show. This star-studded event included appearances by presenters Afemo Omilami, Carl Payne, Danielle Nicolet, Darrin Henson, Donnie Simpson, Nicole Beharie, Soledad O’Brien, Richard Lawson, Patrik-Ian Polk and Terri J. Vaughn. Legendary hip-hop artist Chubb Rock served as announcer during the show. Musical performances throughout the show presented a positive, uplifting score for an evening of excellence. Grammy® Award winning hip-hop artist, T.I. delivered an original spoken word piece titled “United We Stand”, urging youth to not use the spirit of activism as an opportunity to elevate their social media presence. 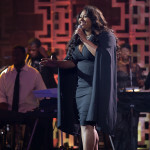 In a soul stirring performance, gospel recording artist, Tasha Cobbs brought the crowd to their feet with a medley including the television debut of “Put A Praise On It” and Grammy® Award winning single “Break Every Chain”. The Youth Ensemble of Atlanta, the South’s leading African-American theatre company for young adults, unveiled “Put Your Guns Up”, a moving performance art tribute recounting the victims of unfortunate deaths as a result of gun violence. Led by the program’s Musical Director Robert Glasper, house band The Robert Glasper Experiment performed a touching rendition of “I’m Dying of Thirst”. Grammy® Award winner Estelle performed her anthem of perseverance “Conqueror” in honor of the inspirational work that honoree Rev. Dr. Joseph E. Lowery has done for the civil rights movement. Singer, songwriter Chanté Moore was joined by Stokley Williams of R&B group, Mint Condition for an enchanting performance of “Someday We’ll All Be Free”. Ledisi, a leading R&B recording artist and actress with credits including the Academy Award nominated film Selma, performed her hit single “Gonna Be Alright” championing Rev. Al Sharpton, whose 61st birthday coincides with the broadcast premier. Multi-hyphenate entertainer and distinguished honoree, Tyrese took to the stage for a rousing performance of his chart-topping hit single “Shame”. Paying tribute to Nina Simone’s legacy of activism through the music medium, Grammy® nominated singer Jazmine Sullivan performed “Baltimore”, a song from Simone’s 1978 album that is once again reflective of the times. Tichina Arnold channeled the Godfather of Soul, James Brown for a show-stopping cover of “I Got The Feelin”, went on to reunite with her Martin co-star Carl Payne – who also served as a writer for the program – for a must-see comedic enactment of “Cause I Love You”. The 2015 Triumph Awards are Executive Produced by Bart Phillips of Sunseeker Entertainment and Christina Norman of Gemini Entertainment. Janaye Ingram is Executive Director of National Action Network. Craig Henry and Lamar Chase serve as Co-Executives in Charge of Production, Robyn Greene Arrington is vice president of original programming and production, Donyell McCullough is Senior Director of Casting and D’Angela Proctor is Head of Original Programing and Production for TV One.